The Asclepius - Medical Vetting by Timothy McCall, M.D. is the symbol of medicine and healing, based on the ancient Greek God Asclepius. Among Asclepius' daugthers were Hygieia, the Goddess of cleanliness and health, and Panacea, the Goddess of the universal remedy. Hippocrates, considered the father of medicine, came from a family of physicians, said to have been directly descended from Asclepius. In his time, Hippocrates and other physicians were referred to Asclepiads. ​The Caduceus, aka the Staff of Hermes, has two snakes winding around a winged staff. It is sometimes confused with the Rod of Asclepius, which has a single serpent. 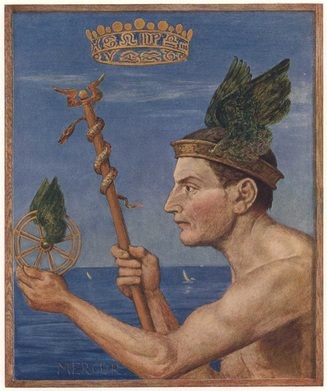 The Romans referred to Hermes as the God Mercury. ​In yoga, depictions of hypothesized energetic pathways (called Nadis), which are said to wind up either side of the spine, resemble the Caduceus. One Nadi, called Ida, terminates in the left nostril, and has been linked in function to the relaxing parasympathetic nervous system. Pingala, ending on the right side, has been linked to the sympathetic "fight or flight" branch of the autonomic nervous system. ​Medicine is symbolized by the Rod of Asclepius. The Staff of Hermes or the Caduceus is associated with beauty in communication. The two meet in medical vetting. The goal is to facilitate prose that is elegant, in the sense of being no more complicated that it needs to be to convey accurately and compellingly the writer's intention and current medical understanding. Credits: (1) Mosaic at the town hall of Neumünster, Schleswig-Holstein, Germany, photographed by Uwe Barghaan (2) Hans Thoma [Public domain] via Wikimedia Commons (3) from the book, The Serpent Power by Sir Arthur Avalon, first published in 1919 (4) The MedicalVetting.com logo was dreamed up by Timothy McCall and brought to fruition by Stephanie Salmon, designer extraordinaire, from Gotham City Graphics in Burlington, VT.